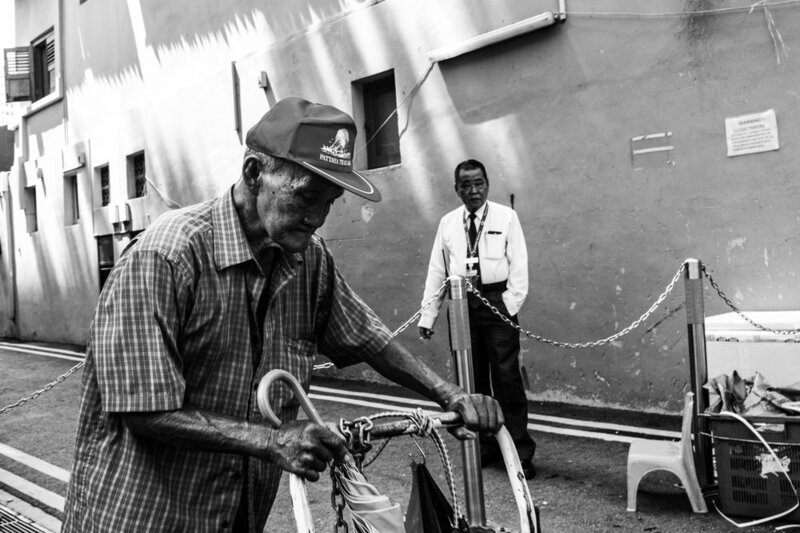 The specter of being socioeconomically ‘left behind’ in society as one advances to statutory retirement age and beyond is a perturbing prospect confronting many elderly Singaporean men today. With no state welfare pensions scheme in place, increasing cost of living, a heavily technology-driven economy and no state-sanctioned policy of minimum wage, under-skilled elderlies without any savings or caregivers to rely on face extreme difficulty seeking out much needed gainful employment in order to sustain their daily living – and often enough, they don’t quite make it. Add in to the mix of factors higher life expectancies and an ageing population, things get ever more complicated for this increasingly marginalized segment of society in Singapore. This series of photographs features elderly men trying to cope in an environment where economic obsolescence, if not already experienced, is feared to be just around the corner for them. An elderly manually transports a package along a sunbaked street lined with traditional shop houses on a weekend. An elderly diligently ‘at work’ on a Sunday, scavenging scrap materials and litter on the street whilst a gentlemen looks on. 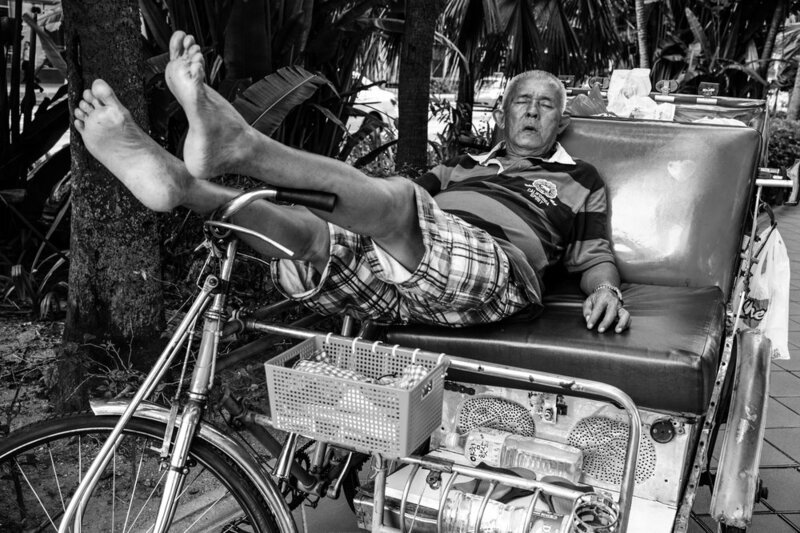 An elderly trishaw rider pauses at a sidewalk to rest his tired feet. Once a ubiquitous trade, trishaw services have dwindled significantly with the modernization of Singapore. 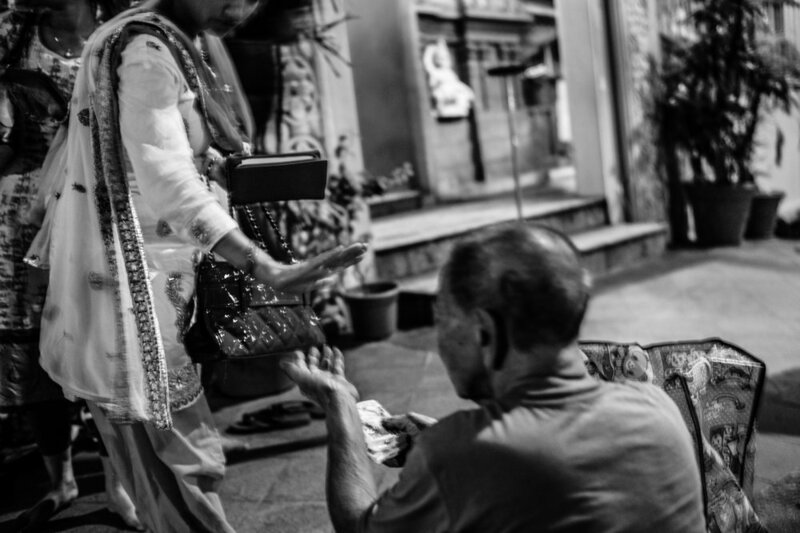 A jobless elderly insists on handing over some tissue packets in exchange for being paid, but was kindly refused by a devotee outside a Hindu temple. 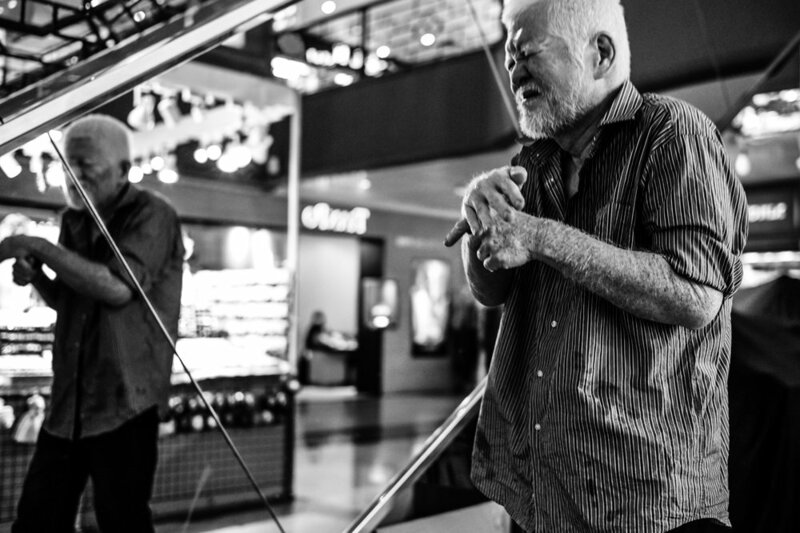 An elderly ponders his next move over a friendly game of Chinese chess in a food court. A semi-blind elderly with obvious physical afflictions wanders aimlessly and in agony in a shopping mall, with no help in sight. An elderly street cobbler beavers away on a late Friday night outside a busy subway station. An elderly gazes pensively from a distance at a street in Chinatown, as if wondering how to fit in anymore.